In 1904 a small, distant war brought Russia to the brink of internal collapse – and yet within ten years the country embroiled itself in an incomparably larger conflict close to home. How the war with Japan and its aftermath actually steered Russia toward such an unlikely, fateful decision is the subject of David McDonald’s book, an analysis of Russian foreign policy on the eve of World War I. The revolutions that followed the Russo-Japanese War confirmed Russian statesmen in their belief that complications abroad threatened the domestic order. McDonald shows how this perceived connection prompted the institutional measures intended to minimize the risks of foreign entanglements, principally the reform of the Council of Ministers as a “United Government” that would share the emperor’s role in forming foreign policy. These measures, as McDonald demonstrates, had a decisive effect on Russia’s restrained response to trouble in the Balkans, and consequently, on the course of world history. 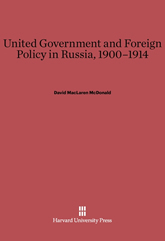 McDonald’s analysis integrates the history of Russian foreign policy at this critical juncture with accounts of the “crisis of autocracy” that marked the early 20th century. Depicting Nicholas II’s struggle with his ministers over the direction of foreign policy, the book offers insight into the evaluation of the bureaucratic state and its relation to domestic society in late imperial Russia.